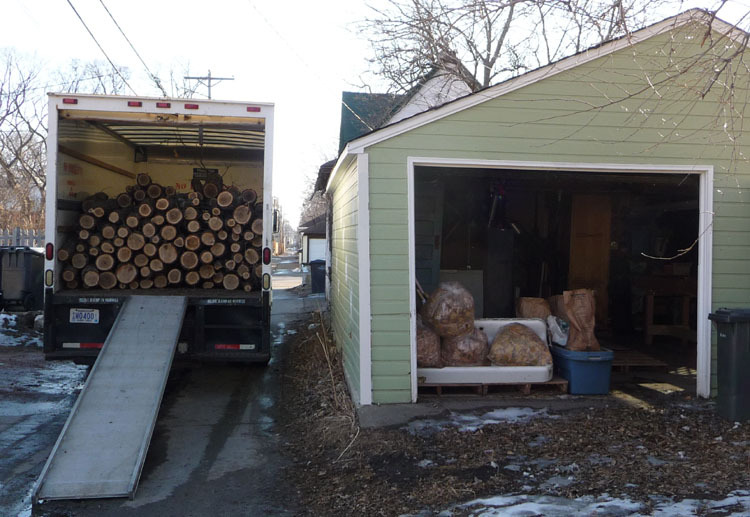 We have been moving logs into the Minneapolis workshop and other nearby space, but we have also been moving them out again in droves. And this has been possible only with the help of volunteers, who have been putting in hours cleaning logs, plunging spawn into logs, and sealing up these spots with cheese wax. I have also gotten a some help moving logs after a pick-up from my loggers. Thank you intrepid volunteers! This is a photo of inoculations, from the drilling station in the foreground to the application of spawn in the middle ground, to the waxing station in the background. Then the logs rest nearby until I get a chance to move them out to the farm. 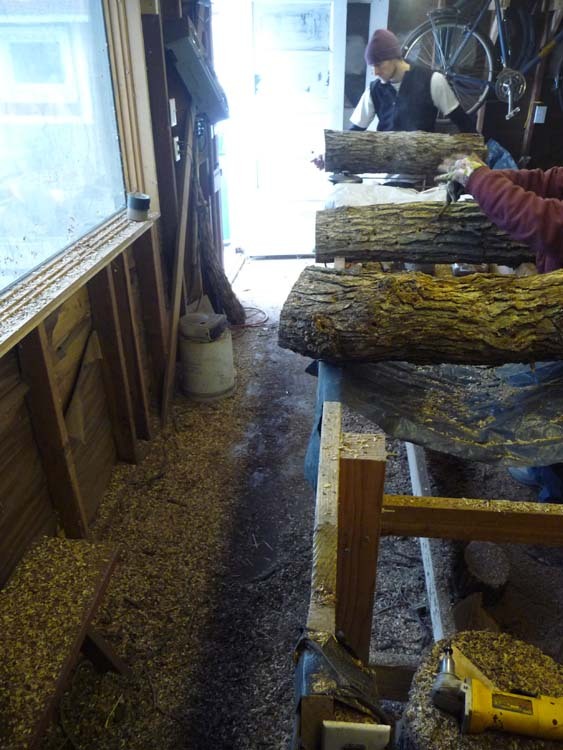 We have inoculated over 200 logs so far this season, and we are now inoculating about 20+ per day. We get a lot done, but we’ve also had some good discussions about mushrooms, farming, food, and some life stories. Let me know if you’d be interested in volunteering, now or later in the season. See the volunteer tab for more details. 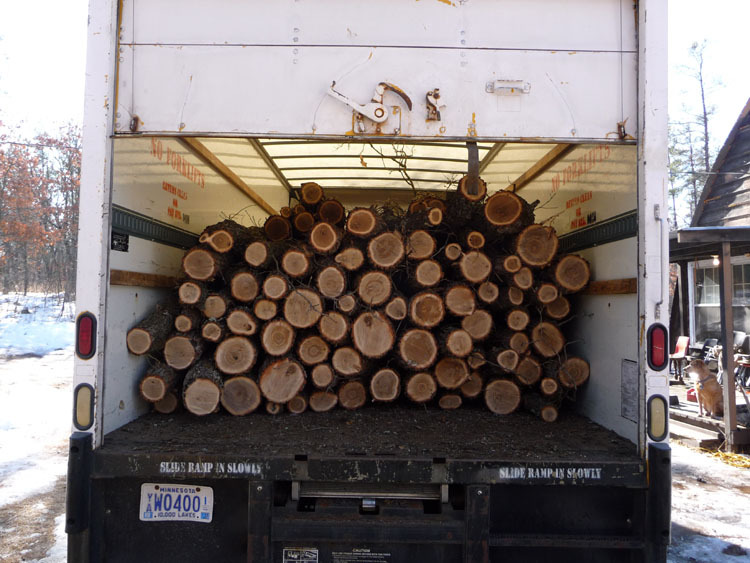 This morning I took a large truck an hour and a half or two hours north of the Twin Cities to pick up about 250 white oak logs. 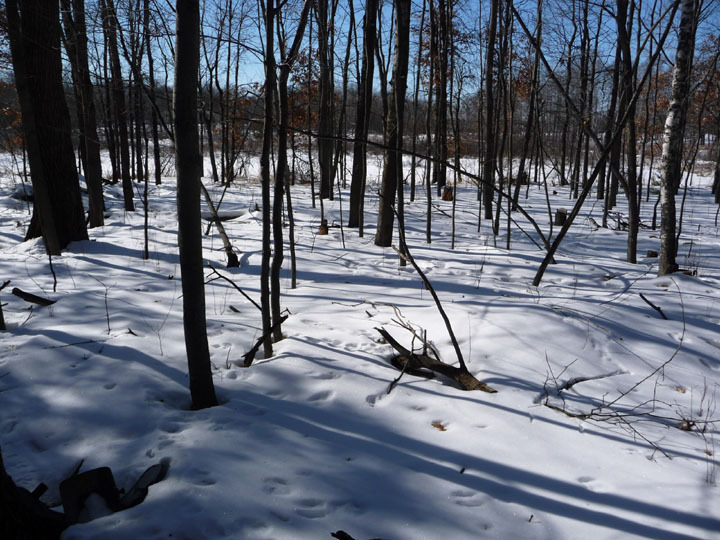 This photo is taken at the cabin at one of my loggers (to the right in the photo). They were a bit short, so they cut down a couple more trees to fill out the load. Here is the truck again, but back at the inoculation workshop in Minneapolis. I spent a couple of hours unloading the logs. They are now stacked in the workshop, so I can start inoculations tomorrow. And I have another week of inoculations before making another log pick-up! A couple of years ago I built a dry root cellar in our basement in order to keep vegetables and fruits over the winter. I framed in a corner of our basement, put in a door and used a window to give the room access to the cool air from outside. Last year I acquired a half dozen refrigerators in order to store spawn and fresh mushrooms. I decided a walk-in cooler would be more efficient and convenient, so I decided to make our root cellar also work as a walk-in cooler. 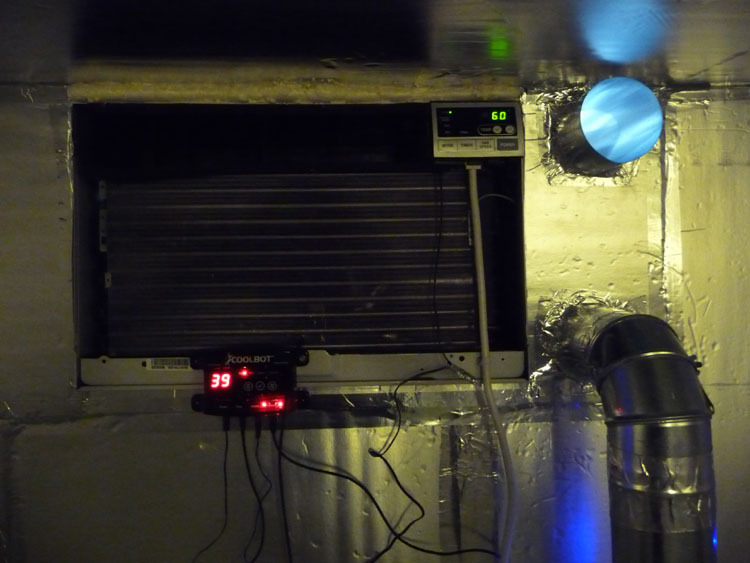 The walk-in cooler is essentially complete now, after working on it on-and-off for a couple of months. This just in time for my first order of spawn that came in yesterday – about 100 lbs. of shiitake sawdust spawn. I started the work in December by papering (can that word be used here?) 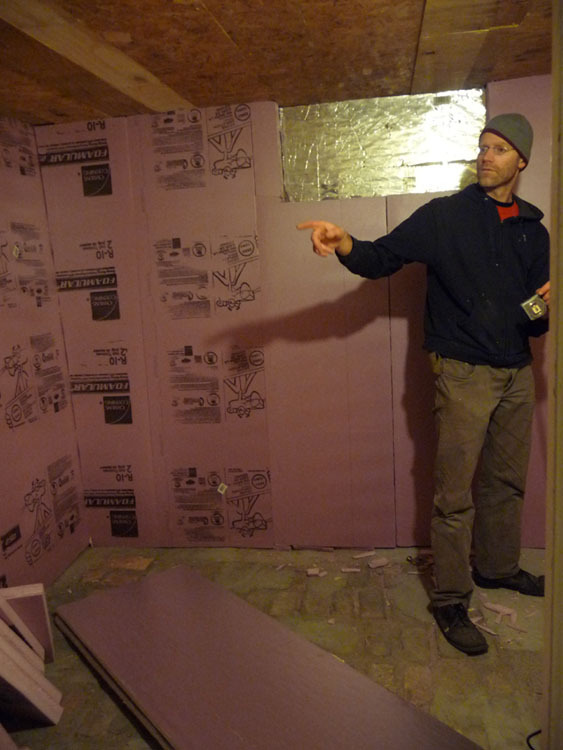 the walls of the root cellar with rigid insulation, enough to give the room an R-value of at least 20. I didn’t screw the insulation into the walls behind. Rather I just cut the pieces tight enough so that they would stay put. This photo was taken just outside the root cellar/walk-in cooler. 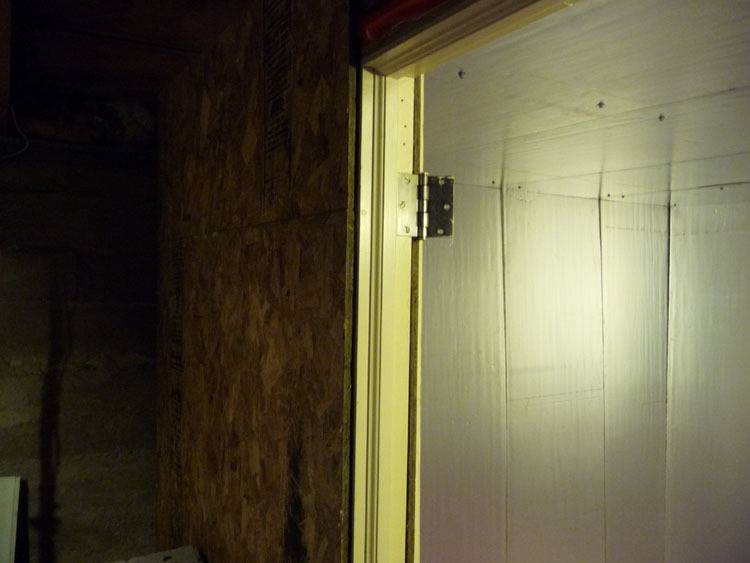 While I used pink insulation for the bulk of the insulating value, I finished it off with the yellow insulation with a foil face, since this surface will shed the condensation that occurs in this type of environment. I also taped all the seams with foil tape and spray-foamed around the receptacles. Unfortunately the yellow insulation in particular is not an environmentally friendly product, but I couldn’t think of a good alternative. Please comment if you have any thoughts about this. I put insulation on the floor and I used self-tapping screws with a rubber gasket to attach the insulation to the ceiling. Here is a photo of the wood threshold I put in that shows how much I built up the floor. 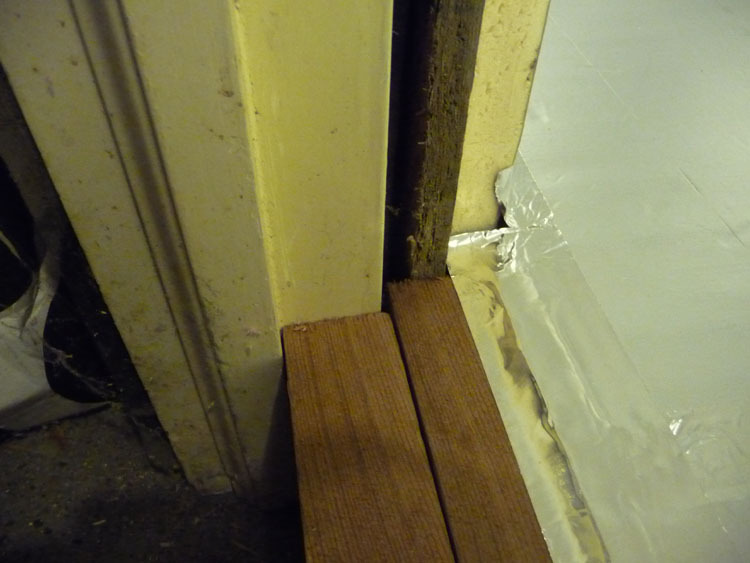 After putting in the threshold I put down some painted plywood sheets in order to protect the floor insulation. Finally to the fun part! 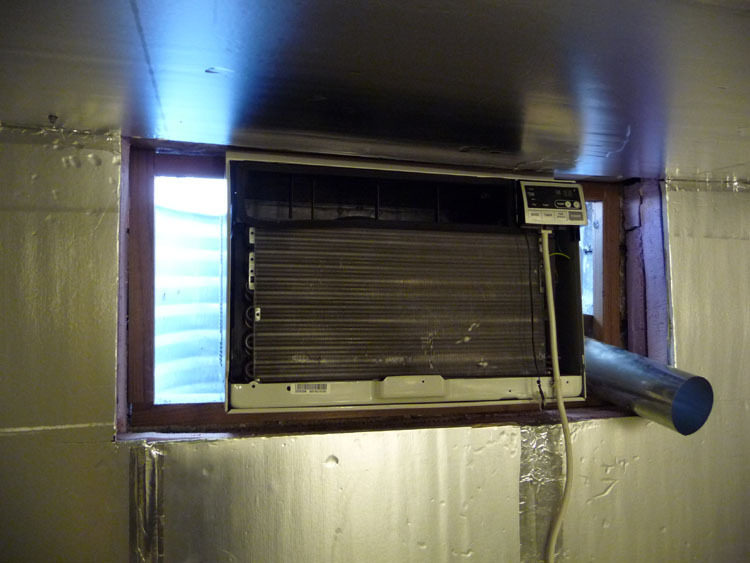 I put in the air conditioning unit that will work in the warmer months and the vents that will bring cool air inside in the winter to cool the space. Finally, I insulated around the window and hooked up the coolbot, a device that tricks the a/c unit into staying on to cool below the temps it would usually go. My thermostat is currently set at 38 degrees, or about what a refrigerator runs at. So far it is staying at that temp, or a bit cooler.